Try to use ResetIsDirty() before you make any changes in the editor. An example would be to use RestIsDirty() during the initial page load. Then try to test to see if isDirty() works correctly for you. But I don't understand how this function work. 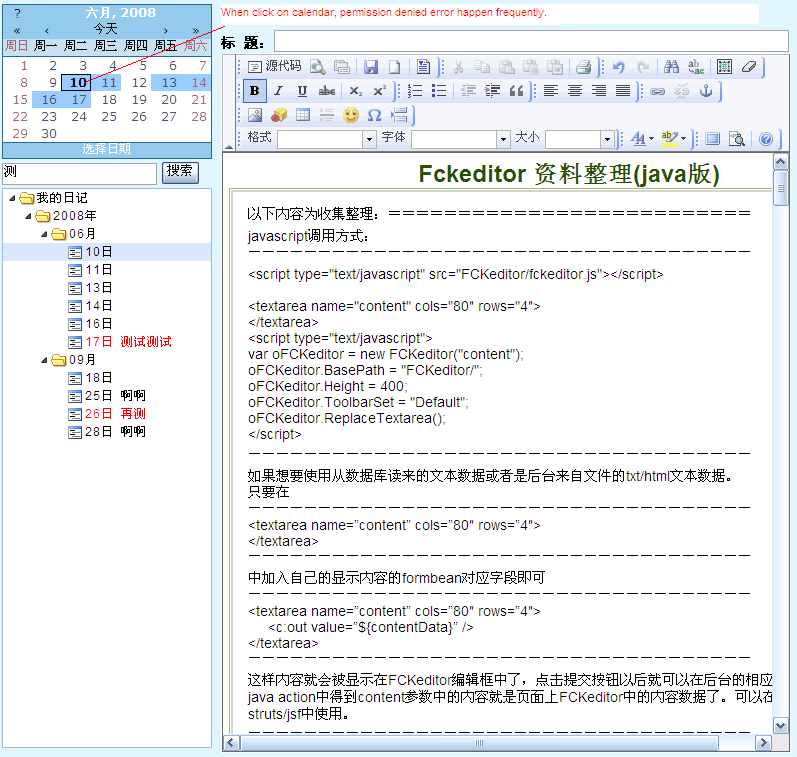 My situation is : I have got a FCKeditor in a diary page.When I click on the calendar I replace the editor's content with the data saved in the server using ajax.And before this I want to judge if the editor have changed,so I can save the changed content to server. How should I do to make this work? without some code or even better a page to test, it's quite hard to understand what's your problem. //Find it ,fire the click event on the node and that will call the getDiary function. This type of issue can be timeout related, and can occur when loading either large or content rich data into the editor. Try the following code on the onload event of the offending markup. You may have to tweak it to get it working in your Implementation but the principle remains the same. What do you mean about "outside of FCKEditor's domain". Sorry vincentchan, havent been back here for a few days. What I mean by "outside of FCKEditor's domain" is simply that this type of error tends to occur from non-FCKEditor script impacting on the editor or non-FCKEditor script completely unrelated to the editor. By itself FCKEditor doesnt produce this kind of error. So, it could be a combination of things or something else entirely. Don't know if this will help, but I found that if I paste a document from word with a colon in it, and save the content to a database and try to load the content, that will cause the problem. Try replacing all colons with &#58 before saving.